The episodes are basicly the same as in the first series. Out of the 14 episodes I have seen, eight of them were featured in the original series. The only difference is the inclusion of an extremely boring character. The mentioned character's personality is a kind-hearted copy of Tamama, with the ability to copy other characters. His name is... Keroro... just as the main character. The music is bad, really bad. The intro theme is probably fine, and there is no ending theme, but the BGM is very forgettable. I can't even remember one single track I liked while watching this. This is a huge contrast to the original series. As for the parodys/refferences, there is absolutely none. They have been stripped out. The running time is three minutes as well, which results in a shortened version of the manga chapter it is made after. - There are episodes based on the 21th volume of the manga, which wasn't released when the show still aired. - While childish, they have a huge amount of scenes only otakus would appreciate, which shows they're still caring for the manga demographic. If you are a fan of the original series, watch this and make your own judgement. If not, please watch the original series before criticizing the franchise. Either way, this won't be a (good) memorable experience. As a long time fan of Keroro Gunso for the past five years, I was looking forward to this reboot with unbridled anticipation - The original Keroro Gunso anime was on hiatus, the English dubbing had stopped, and Tokyopop closed its doors so the manga was no longer being translated. The announcement of this anime was monumental in the small surviving fanbase, and everyone was sure it would be a beautiful remake, with only a few people like myself having niggling doubts. Unfortunately, upon it's release, it was obvious that even with the doubts we had, we had very much over-estimated this anime. For one, it is a flash anime, and a very lazy one at that. More than half of the movement is poor tweening, and the actual drawings themselves are like very poor tracings of Yoshizaki's amazing style, the Keronians having misshapen heads and the humans having varying continuity with the way they are drawn. The length of the anime is unacceptable, each episode being three minutes long. Hetalia had more time than that, and it was based on a four panel comic series, which was why the five minute episodes actually worked. An episode of Keroro cannot physically fit into a three minute time slot (around two minutes if you exclude the intro song and the outro jingle) without major cuts of detail, which makes it feel unfinished and hard to understand, even as a long time fan. In the most recent episode as of this review, when New Keroro was introduced, this was only further proven to me, as I have currently not read that far into the manga, and watching the episode gave me absolutely no information or depth into any of the new characters. Each episode is a frustrating and forgettable experience in this way. Characters are introduced too quickly and have little to no dialogue thanks to the short time span. The episode that introduced the other four members of the Keroro platoon and Angol Mois was essentially a very fast slide show, with no context or detail. Dororo, Kururu and Tamama didn't even get proper lines in this episode, and Giroro and Mois had a grand total of one line each, which is a real shame as the voice actors remain the same from the last series (excluding Fuyuki's previous voice actress, Tomoko Kawakami, who sadly died of breast cancer in 2011). They had to even alter how the story went down, as there wasn't enough time to introduce Dororo's partner Koyuki, which was painfully obvious and cringe-worthy. They had one brilliant idea for this anime, and that was to make physical models of the back drops, which would probably look good if they weren't always blurred, which to me makes it seem like a lazy attempt to animate even less than they already do, and also makes the mediocre character art work stand out even more. The models would be on my small list of things they did right if it wasn't for the blurring, so you can't even truly appreciate it without concentrating anyway. The only real redeeming factors of this anime are the voice acting, which I believe has been superb since the first episode of the first anime way back in 2004, the intro music, which is very catchy and is performed beautifully by Mayumi Gojo, and the new colour schemes and style that has been implemented. Unfortunately, it is very hard to enjoy these small mercies when the show is too short for any real amount of voice acting to be heard and has a drawing style is so bad that the colours are the only thing that can even vaguely salvage them. Over all, as a die hard fan of the Keroro franchise, I can only say that this reboot is inexcusably abysmal, and does not do the franchise one lick of justice. I will continue to watch, in hopes that the episodes will some how improve or come to an interesting conclusion, but right now as it stands, I think this reboot can only be described as botched and a huge let down. If you are new to the Keroro franchise, don't bother watching this show, as you will have as much information when you leave as when you started. you will probably also be more bored than when you started. I can only barely recommend it to fellow die hard Keroro fans, if only because it's the one scrap of Keroro content we can get our hands on now that everything else has been canceled or is on hiatus. 2/10. As a faithful adaptation of the Keroro Gunso manga meant to stand on its own legs without the viewer having any previous knowledge of the franchise, I would call this a pretty feeble attempt. The character development and plot is slimmed down to bones and overall its dialogue is cut and paste from the manga without much of its proper comedic timing. But I don't think this is what this version is trying to do, not really anyway. 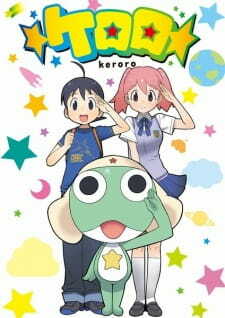 "Keroro" feels like an infomercial for later volumes of the manga. From what I can gather, Keroro and his platoon remain popular characters for children in Japan, so they don't really need to be retold the origin story. But some of them might want to see the latest characters fleshed out with sound and color - and that's where this show comes in. New Keroro, Tomosu, Black Star and Kaneami are the latest additions to the manga (vol. 23 onward) and really are the biggest attraction to this new adaptation like 'em or not. The new cast members play their parts well, I'm especially impressed with Aoi Yuki's performance as New Keroro, who is cute and perky and really makes his equally adorable design really pop. The rest of the returning actors slip right into their roles as if nothing changed either. Unfortunately, those who are looking to find out more about the original Keroro Platoon will be disappointed as their screen-time is limited. But here's the thing, I may admit that "Keroro" is not that fantastic of a production, even if only comparing it to other short anime of its breed. But as a long time fan of the franchise with no where else to go for new content, sometimes I need to be reminded of why I love these goofy characters in the first place. I look forward to watching it every week and will be sad when these shorts stop airing. Also, the manga may not be legally translated in the U.S. anymore, but after this show aired I imported some of the manga and tried my best reading it raw. So if this show was made to inspire viewers to buy the book, then it definitely did its job.